One of the best football players in the world is also a huge poker player, so much so that he has decided to join the PokerStars.com team, becoming yet another famous face giving them publicity. The player in question, Cristiano Ronaldo. The rumors began in early May on whether he would sign with them or not. On Wednesday, it became public that he had signed with PokerStars. Many are comparing this to when another famous Ronaldo joined their team years back, and has even appeared in a couple of commercials. This will give Cristiano yet another sponsor to add to his already large list. He is the second best paid athlete in 2014, where he has a net worth of $80 million, as he is sponsored by other brands like Coca-Cola, Motorola, and Castrol, among others. This is not just another way to earn money, and as we can clearly see, he does not need it. He has stated that he loves playing poker and looks forward to playing online. 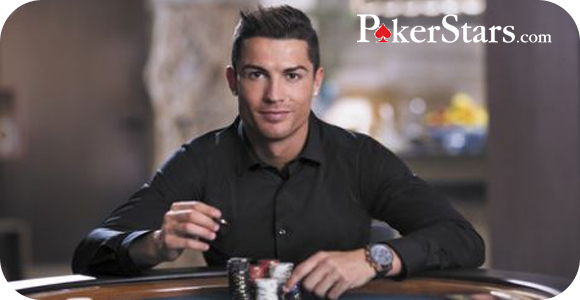 He will be using the user name C.Ronaldo, so be sure to look out for him whenever you play at PokerStars and maybe he is as good at bluffing as he is on the field. © Copyright 1999-2017 Poker Gaming Ltd. All Rights Reserved.